From voaspecialenglish.com | facebook.com/voalearningenglish Every year, a big parade is held in Houston, Texas. On parade day, horses -- not cars -- control the streets of the fourth-largest city in the United States. FAMILY: "We've never seen so many cowboys and cows and horses all together with all the trail wagons." 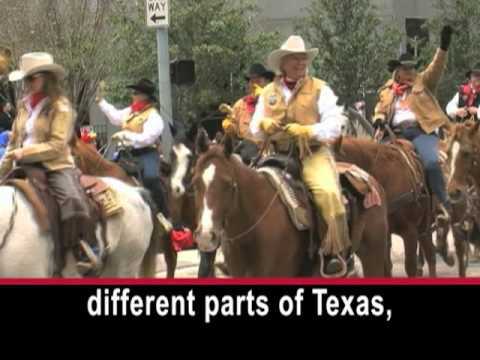 Since 1938, the parade of horses, cowboys and cowgirls has marked the beginning of the Houston Livestock Show and Rodeo. FATHER WITH SON: "Lots of horses, you like that? It is pretty cool, huh? Yeah!" GIRL: "I am going to ride them when I get bigger." The horse riders gather in different parts of Texas, some of them hundreds of kilometers away. They ride into Houston and camp overnight. For Santos Cruz, this is a chance to connect with the past. SANTOS CRUZ: "I wanted to have a feeling of how our ancestors had to cross this prairie at one time or another you know, when they--there was no cars." Gerald Barkley and his friend, Donald Kimble, come to Houston every year and meet with friends they have made on the trail rides. DONALD KIMBLE: "We all get together and enjoy each other and which some of us haven't seen each other in a year, so that brings out all the good to me." GERALD BARKLEY: "They promote this way of life so you know, it doesn't you know, fade away from existence." I'm Ted Landphair. Видео The Day That Horses Rule the Streets of Houston делает английский язык более доступным.